Recent events sparked my interest in breaking out my Jumanji board game to play it one more time before I put it away in storage. My fiancee found this board game a few years ago. She brought her old Nook ereader to trade in at a local used book store which also sold board games and some retro games. With her credit from the trade, she purchased a handful of physical books and this copy of Jumanji. Before then, I only recall playing this game once or twice at friend’s house as child. I never owned it, but I remember loving the movie. I remember being both fascinated and a bit disturbed by some of the material in Jumanji– I was three when it came out. And when you don’t know what CGI is as a kid, it was easy to get lost in the film’s high-stakes adventure. Robin Williams’ character was energetic but heartbreaking. And this marked a big step for Williams into family-oriented films, after building a reputation for mostly more adult films like Good Morning, Vietnam and The Fisher King. 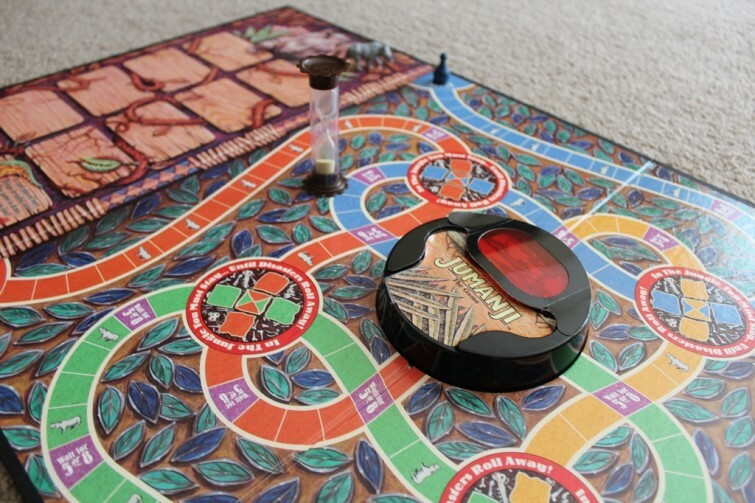 I certainly wouldn’t call Jumanji one of his best films, but there’s enough nostalgia with Jumanji that I was excited to play the board game. The first thing you’ll notice is that the board is colorful and detailed, but it doesn’t look much like the board game that Judy an Peter play in the movie. And unfortunately, the pieces don’t move on their own, the center card reader isn’t magic and rolling certain numbers on the dice will not summon any jungle animals. As you can see, the board is rather sizable too. The entire board is about the size of two monopoly boards stacked side-by-side. The first time I played this was on the floor. But since the game can take a long time to finish, it makes sense to try to find a table large enough to play it on. However, it does require some skill, because the game isn’t played exactly like the one in the movie. Players have to face different dangerous adventures (by rolling dice). If the players collectively fail too many times, the group will lose the game. 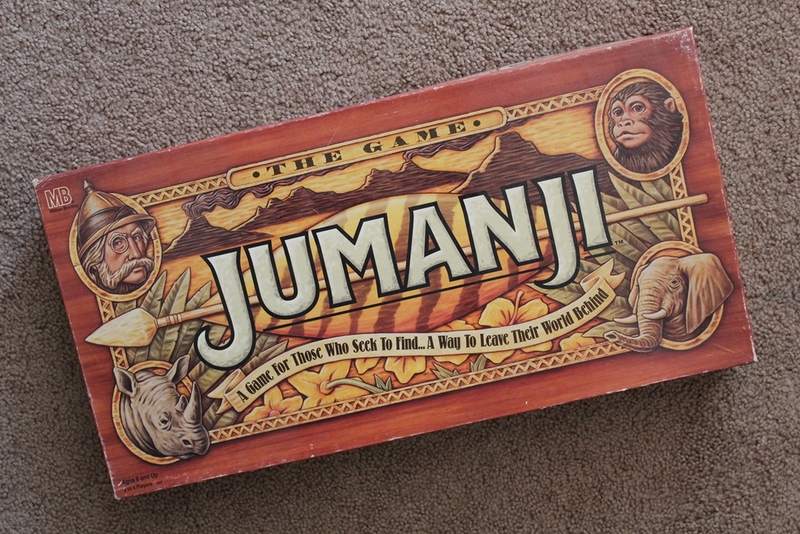 If not, the first player reaching exactly the center of the board and shouting “Jumanji” will win. So either one person wins, or everyone loses. 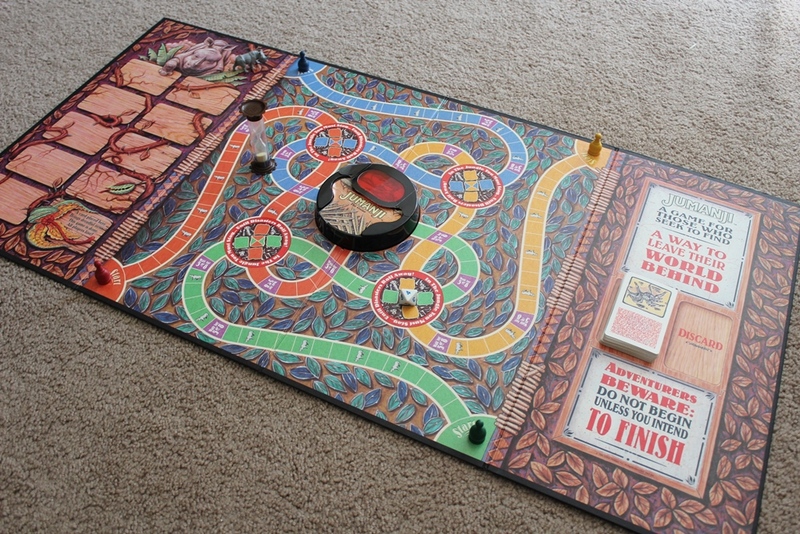 The portrayal of the board game in the movie is one of dispair. Jumanji is cursed. Every roll of the dice puts everyone in danger. So in keeping with the movie, the outcome of the dice rolls are random. And the lack of strategy will make this game fun only for those just old enough to play the game with nostalgia. Jumanji comes in different variations. Mine is pictured below and is enclosed in a cardboard box and fortunately doesn’t make any reference to this being a movie tie-in. If you can find it, there is a limited-edition version of the game that looks identical to the one in the film. For the best experience possible, play the game together with three friends with the movie playing nearby. You can purchase a copy of Jumanji right here on Amazon. Since the game is over 15 years old, prices can vary.